Europe's particle physics lab, CERN, is losing ground rapidly in the race to discover the elusive Higgs boson, or "God particle.". The particle, whose existence has been predicted by theoreticians, would help to explain why matter has mass. Finding the Higgs boson is the major goal of the Large Hadron Collider (LHC) at CERN along the French–Swiss border. 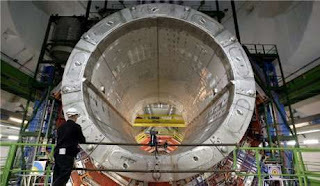 CERN’s research was interrupted when an accident damaged some of the magnets that make up its collider ring. CERN has been in competition with the US Fermilab, also seeking confirmation of Higgs boson using its own particle accelerator called the Tevatron. The smaller the mass of the particle, the more difficult and time-consuming it will be for Fermilab to detect. But Fermilab estimates that the Tevatron has already picked out about eight collision events which may be hints of the Higgs. What is the Higgs boson? In quantum physics, the Higgs boson is one quantum component of the Higgs field. The Higgs field gives mass to every elementary particle that has mass. Think of the Higgs field as a big pool of molasses that causes all the massless particles that travel through that field to come together, converting them to particles with mass that form the components of atoms. In theory, without the Higgs boson, nothing in the universe could have mass. Without it, the universe and all that is in it would be without form and void. It is the Higgs boson that converts the invisible into the visible and it converts the immaterial into the material. The Higgs boson was first theorized by science in 1964 – but it was first revealed some 1900 years before that. The more we learn about the ‘invisible things of creation’ the more difficult it is to reconcile that creation with the theory of unguided evolution. The Higgs boson is nicknamed the “God Particle” because it does exactly what the Bible says God does – He holds the universe together. Look over those verses again, carefully. One of the key words in the Colossians passage above is the Greek word sunistemi which means "to stand-together," "to be compacted together," "to cohere," "to be constituted with." The nucleus of the atom contains positively charged and neutral particles - to use a simplistic model. Mutual electrostatic repulsion between the like-positive protons would drive the nucleus apart if it were not for the "strong force" which binds the nucleus together. There is thus an active force imposed on the universe, which actively holds the very atoms of the material world together moment by moment, day by day, century by century. Similarly, accelerated electrons circling the nucleus should quickly radiate all their energy away and fall into the nucleus unless there is an invisible energy source to counteract this. While we've not yet identified the God particle, we have managed to split it. The resultant explosion that occurs is called an 'atomic reaction'. It is hard to imagine what would happen if every atom was suddenly allowed to come apart. The Apostle Peter was given a vision of the unimaginable, and he did his best to describe the scene. The more we learn about science, the more it confirms the Bible. Peter is here perfectly describing a scientific process that wasn’t learned until 1945. The Big Bang theory demands that time move more rapidly at the edges, and more slowly at the center as the universe expands. Einstein’s theory of relativity says while the expansion of the universe took billions of years as measured from the outer edges, viewed from the center, it would have only taken a matter of days. So the six days of creation are compatible with science after all. While scientists attempt to find the “God particle” that holds the atoms together, science has already located, identified and mapped the glue that holds each of us together at the cellular level. Laminin essentially “glues” the cells (such as those lining the stomach and intestines) to a foundation of connective tissue. This keeps the cells in place and allows them to function properly. Without laminin your cells would fall apart. The structure of laminin is very important for its function. It is that structure that I found so amazing when Pastor Gene Payne of Raleigh, NC sent me a photo. It was so amazing that, although I respect Pastor Payne enormously, I immediately suspected he'd been taken in by hoax and checked it out on Snopes. Scopes confirmed it to be true. It is NOT a hoax. I was going to embed a photo of laminin, but decided instead to post a link to the photo Pastor Payne sent me so you can see what laminin looks like now that you know what it is. I want you to be as awestruck as I was. Go ahead and click on the link . . . I’ll wait until you get back. This is the structure that holds you together. Here is another picture, this one I downloaded from Snopes.